Our consultancy practice encompasses a broad range of business services including addressing and institutionalizing change, strategy formulation and implementation, and performance solutions that enhance competitiveness, create new sources of economic value, and drive growth. Our business solutions tools encompass scanning attitudes and perceptions of potential means for improvement and collecting new and fresh perspectives of performance. 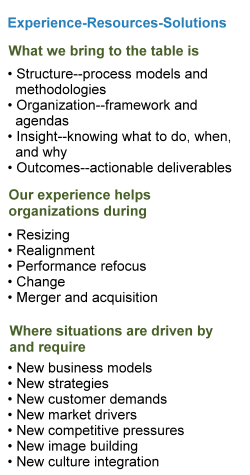 This approach provides a unique platform for articulating an important cross-section of voices in the organization and is an ideal for strategic visioning, understanding the implications of change, post merger integration, and for identifying important business signals. Company profile: A $2 billion defense company. Company profile: $1 billion dollar clinical and industrial laboratory supplies company. Company profile: A $5 billion international entertainment company with over 6,000 locations in over 25 countries, 65,000 employees with global presence. Company profile: $100 billion dollar international conglomerate. Company profile: Major defense contractor. Company profile: South Korean industrial company. Company profile: Auto parts supplier. Company profile: Product start-up company. Agency profile: The Federal Executive Institute (FEI), Charlottesville, Virginia. Agency Profile: An Agency of the US Department of Commerce's Technology Administration. Agency profile: US Army III Corp, Fort Hood, Texas.